Beside a bat and a ball, fastpitch softball gloves are another essential piece of equipment. Softball players need to catch and hold on to the ball properly, so owning a good softball mitt is a must for a catcher. But just like with any other piece of sporting gear, there are many different brands, styles and materials, which can make the choice overwhelming. With a little research you can find the best fastpitch softball glove that fits your hand and your position. Every softball glove is composed of different elements. These elements vary depending on a style of a glove and player’s position. Webbing is the part that connects the thumb to the fingers. There are two types of webbing, closed and open. Pitchers usually go for the closed webbing to help them hide the ball from the hitter. First base players often prefer an open web, because it allows them to see through when catching fly balls and allows faster transfer to the throwing hand. Pocket is the indentation in the palm of a glove. The size of the pocket depends on the position you play. Shallow pockets are for middle infielders so they can quickly grab and throw the ball. Deeper pockets help outfielders bring in fly balls. Pockets on softball gloves are bigger because of the larger size of the softball. Back is the part of the glove behind your wrist and it can be open or closed. Open back design with an open space above ankle strap allows for a better mobility and a faster ball turnaround, while closed back gives extra strength and support for catching pop flies. The wrist adjustment gives the glove snug fit to your hand. These can either be Velcro, that offers the convenience of pulling and adjusting to your comfort level , a buckle system, laced, or a D-ring fastener that allows you to pull on the lacing and make the glove tighter. When shopping for a glove there are a few points you should take into consideration, including length, web design, and style. One of the most important things to consider is choosing a right glove for the position you will be playing. Whether you’re an A-level or a rookie, it is essential that you choose the mitt best suited for the type of player you are. Outfield gloves are larger gloves, made for diving catches and catching fly balls. These gloves are usually longer and deeper with extra support in the fingers. The pockets for fastpitch softball can be closed webs because they need to be extra deep due to the size of the softball. The typical size of an outfielder’s softball glove is 9 to 15 inches. A catcher’s mitt is the largest on the field because catcher needs to be able to handle and hold onto high speed pitching. It also has the deepest pocket and it does not have separately cut fingers like gloves for other positions. Catcher’s mitts are measured differently: they are measured around the circumference of the glove to capture the entire catching area of the mitt. The standard size range is 29.5 to 35 inches for softball. A first baseman’s glove is similar to the catcher’s mitt, only longer. It is also not as heavily padded around the fingers and the thumb of the mitt is not padded at all. The pocket of these gloves are a bit shallower to allow faster ball-to-hand transfer. First basemen should keep gloves to around 1 inch past the fingertips to maintain a greater amount of control. The typical size range for softball is from 11.5 to 13 inches. Infielders need gloves designed for constant action. These gloves are shorter and have a shallower pocket than others. They are designed for players that play shortstop, second base or third base. Sizing is mainly the personal preference. Many middle infielders are also a “utility” players, which means they will play many or all positions, so they will opt for the larger glove to help them in the outfield. Pitchers don’t usually need specialized gloves. The most important thing for the pitcher is comfort and the ability to hide the ball. Most pitchers choose closed webbing over open to prevent the batter from seeing the ball and not to give away the pitch before they begin their motion. Batting gloves are a different kind of gloves for softball. They are made to protect player’s hand while swinging the bat. Every inch of these gloves is specially designed to give you the best grip, comfort and performance and to prevent stings and blisters from hitting. People tend to use terms “glove” and “mitt” as they were the same. However, there is a difference! Gloves have distinct finger separations, and mitts do not. Mitts are used by catchers and first basemen, while gloves are used by the players on all other positions. Proper fit is essential for a player to maintain control of the glove and the ball. A softball glove should give you a snug fit and you should be able to easily open and close the glove around the ball. The size of the glove depends on the position on the field and on the players age, since younger players typically have smaller hands. Please note that this table is purely guidelines. It is possible that young players have smaller or bigger hands than average, so the glove size should be chosen accordingly. Other than design, the biggest difference in softball gloves makes the leather they are made of. The quality of material is what determines the price, but also the durability and the overall feel. The softball gloves can be made of synthetic leather, cowhide and pigskin, full-grain leather or steer hide. 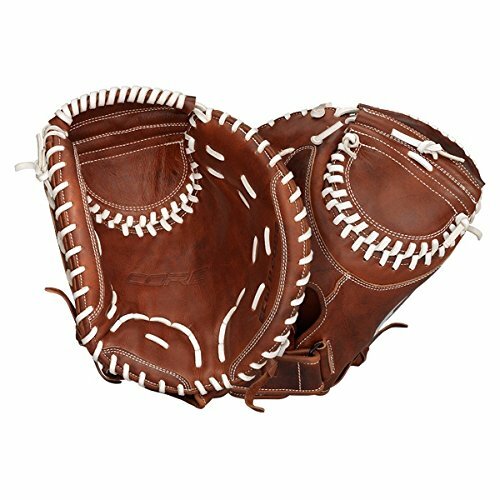 SYNTHETIC LEATHER SOFTBALL GLOVES are generally the cheapest and are recommended for very young players that do not play on high level because they give solid performance at economic price. COWHIDE SOFTBALL GLOVES are a great choice for serious players. Cowhide breaks in quickly and is gives pretty good flexibility. But beware: quality of cowhide can vary greatly from one manufacturer to the other. STEER HIDE is the type of leather that offers heavier weight and durability. One thing you need to know it that there are not standardized guidelines on what is considered to be premium steer hide. That is why it’s important to stick with the established brands. FULL-GRAIN LEATHER is stiff and heavy and requires more time to break in. These leathers are rarely pre-oiled. Once broken in, full grain leather is superior in both performance and durability and it is used by many premium and pro series players. GLOVE COST: Softball gloves come in various prices. You can purchase gloves in retail stores, sporting goods stores, and online. Glove is an investment and you should get the right quality for the price you pay. This of course doesn’t mean that the most expensive glove will; be the best, but don’t go for the cheapest one either. You should be prepared to pay for the quality you expect. Don’t let price be the reason to buy poor quality glove, because it will hurt your performance on the field. When you purchase a brand new softball glove it is important to break it in properly. The best way to break in a glove is to use specially designed glove oil. It keeps the leather “alive” softens it up, while minimizing weight gain. Apply a very small amount of glove oil to a sponge or cloth, then apply the oil to the areas of the glove that are currently firm. Work the oil into the leather evenly. The general rule is to care for the leather of the glove, like you would care for your own skin. Exposure to harsh weather conditions, extreme temperatures or excessive moisture requires extra care. You should never put too much oil/glove conditioner on the leather, as it will damage it and shorten its life. Leave the glove in warm temperature for 24 hours to allow oil to absorb. To make sure that your glove is ready for the game you need to practice with it every day. When you finish the season, apply oil very lightly to avoid the glove becoming brittle. Store your glove with a ball in the pocket to keep its shape. Never try to soften your glove by warming it up in an oven or a microwave, it will damage the leather fibers. Do not use linseed oil or silicon based spray, these will close the pores and cause the glove to harden and dry. Do not apply glove oil directly to the leather, it is too concentrated. Water will cause leather to dry out and crack. The higher the quality of the leather the harder it is to break in. There is no shortcut to breaking in a glove, playing catch is still the best way. All About Fastpitch gives reviews and recommendations aimed to help you make better and more informed decisions when purchasing your softball glove. On these pages you can find some of the best fastpitch softball gloves for this season. Whether you are looking for an infielder’s glove, outfielder’s glove, catcher’s mitt or a first baseman mitt, we hope to offer you information that will help you make the right choice.